All camps are days only, tuesday-friday, 9-5, or 10-4 unless otherwise specified. This may be a partial list-- there may be day camps leading up to the weekends competition that are not listed here. Bring your lunch and dress for the weather! A camp preregistration form appears at the bottom of this page. *WINTER CAMP February 19-22, our annual winter fun camp. Extreme trail, dressage, polocrosse, Quiz Bowl, games & videos-- whatever you'd like to do to keep warm and keep riding! We can also turn 4-Hers into a QuizBowl champions and accomplished riders!! 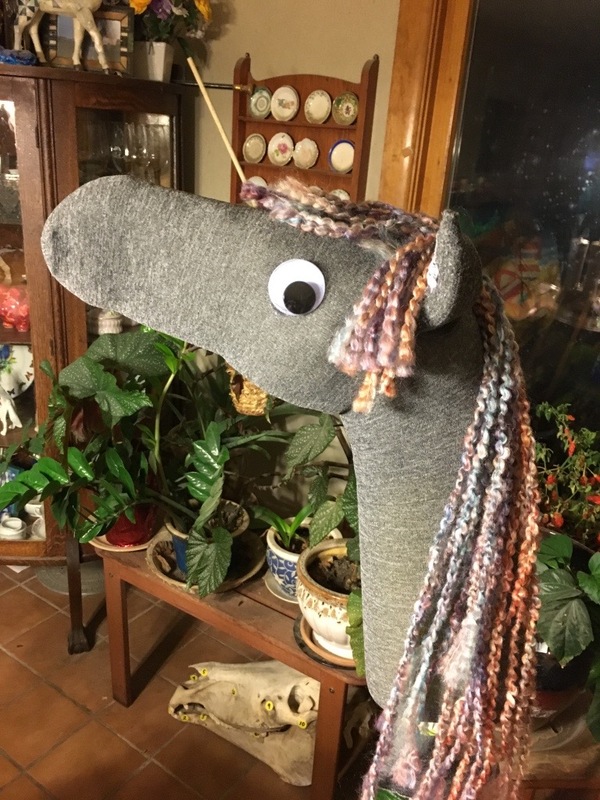 CRAFTS for the coldest of winter days…last year we made fabulous stick horses. *SPRING DRESSAGE CAMP April 16th- 19, and 28. An intense week of Dressage instruction and freedom, leading to our Annual Spring Dressage Show. Come for a week to improve your test scores, show prep your horse, join a Quadrille, form a Pas De Deux or Pas De Trois, put together a Musical Freestyle... the possibilities are endless! One of our most popular camps, signup early. Why fly south when you can get a glove and helmet tan right here in Vermont in April?? Let your creativity shine at this fabulous musical riding camp. *ADULT DRESSAGE CAMP July 17, 18 & 19 (and 27), be ready for Horse Amour Summer Dressage Show on July 28! Practice your test, work on a freestyle, partner up for a pas de deux and form a quadrille team! $200 your horse, $260 ours. *SUMMER DRESSAGE CAMP July 22-26, & July 27. Preparation for our in house annual Summer Musical Dressage Show August 5 . All the fun of the Spring Show, with warmer weather! Practice & prepare your horse/test/music to perfection! Join a quadrille, form a Pas De Deux or Quadrille. Unlimited tanning and swimming! $300 your horse, $375 ours. *SUMMER CAMP July 30-August 2, 10am-4pm. A week of fun in the sun to introduce basic equitation, horsemanship, and stable management skills. 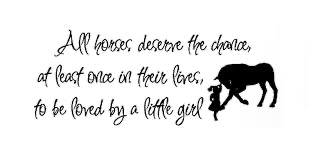 Have a horse of your own to care for. End of week trail ride. Swimming daily. All ages (8 & up) and abilities welcomed. Please email or call for reservations. Camp price: $350 (regular weekly lesson students) $400(visitors) limited space available-- taking reservations now. *JUMPER SHOW CAMP August 21-22. Prepare for our in house Schooling Jumper Show on Friday August 23. Learn to ride a speed round or jump off. $175 your horse, $225 ours. Black Friday Camp: November 29. Send your parents to the mall, and come to the barn to work off your turkey!! 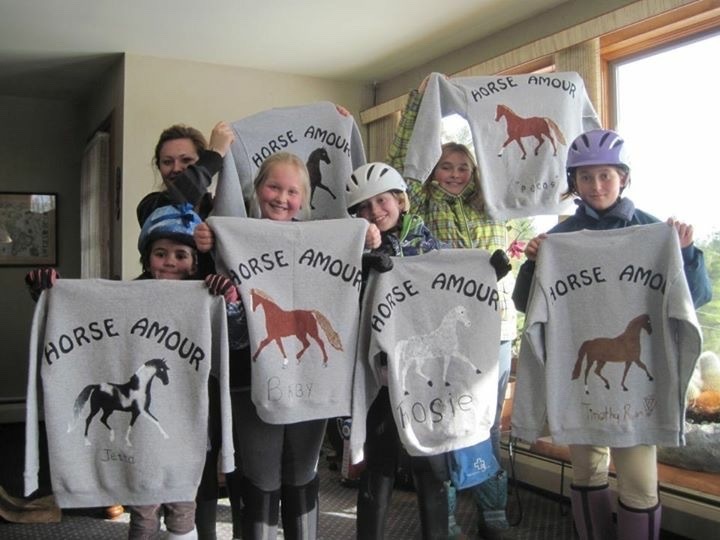 Completed camp form and check made out to Horse Amour, may be sent to 804 Eaton Hill East, Castleton, VT 05735. CAMP REGISTRATION FORM in PDF. “Work Camp” Confident, well trained working students are needed to paint, weed, pick up around the barn and generally help out. Many year round projects need helping hands! Contact Steph to arrange work times. Get extra saddle time to prepare for upcoming competitions, train for HPF or Eddy Farm Trials, or get a chance to put mileage on a young horse. Open to veteran, current lesson students, CSC, GMC or Horse Amour alumni ONLY please. Dates for 2019 work camp tba. Camp is a wonderful thing for the horse-crazy rider that needs more barn time! Come spend the day at Horse Amour and live the good barn life! !